DURABLE OFFICE CHAIR - Featuring a sturdy two tone five-star nylon base with armrests that easily rotate up, Edge is a versatile modern desk chair that offers reliable support for everyday use. 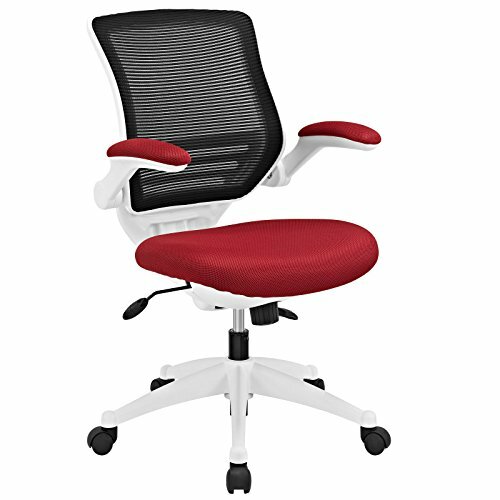 ERGONOMIC SUPPORT - Featuring a breathable mesh back, lower back lumbar support, and padded waterfall mesh seat, sit relaxed in a thoughtfully designed chair that adjusts according to your needs. OFFICE UPDATE - Refresh your office with a compelling seating choice that makes a sleek and stylish statement. Sitting atop five dual-wheeled casters, glide around any flooring surface with ease. SYNCHRONIZED TILT - Complete with synchro tilt and tension control that enables your feet to remain on the ground as you tilt backwards, Edge also features one-touch height adjustment. CHAIR MEASUREMENTS - Product Dimensions: 26.5"L x 26.5"W x 37 - 40.5"H; Backrest Dimensions: 17 - 18"L x 18.5"H; Armrest Dimensions: 25"L x 2.5"W x 26.5 - 30.5"H; Maximum Weight Capacity: 330 lbs.